AUGUSTA, Ga. — Phil Mickelson stood on the 10th tee of Augusta National Golf Club with a swelling crowd behind him. Tiger Woods, his long-time rival-turned-best pal (development of the week!) was beginning his second round. Two of the game's biggest names, with seven green jackets between them and more optimism surrounding them for this year's Masters than the past three combined, had a lot going for them at that moment, at 1:27 p.m. on Friday, as they stood 50 yards apart. But the next few hours were forgettable. Woods doubled the 5th when he had to take an unplayable lie after his approach missed the green well left and trickled into the bushes. On a day when the morning tee times failed to pull away from the pack, Woods, playing in the fourth-to-last group, failed to make up any ground. He was birdie-less on the front nine and turned in 39. Mickelson, at the same time Woods was beginning his round, was on his way to a similarly disappointing number, finishing four over on the back nine. Woods played the back in even par (two birdies, two bogeys) for a three-over 75. Mickelson later signed for a 79, tying his career worst at the Masters. (Said his wife, Amy: "I think he's kind of in shock.") Woods (four over) finished a stroke under the cutline, while Mickelson (five over) made it on the number. "You play well you can shoot under par and I don't know what's happened the last couple of days, it's a little disappointing, because I've been playing so well this year, to play like this," Mickelson said. "But it's disappointing, it's my favorite tournament of the year and it's a rough couple of days." While Woods failed to play himself into contention, Mickelson played himself out of it. Mickelson birdied the 2nd but bogeyed the 4th, yet he was never more than two off the lead. Then came the 9th. 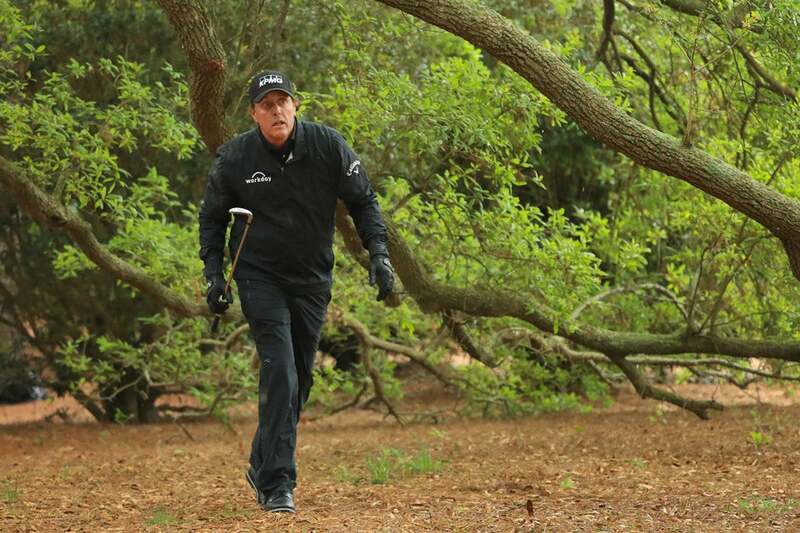 Mickelson went way right off the tee, and his punch two-iron hit a tree and ricocheted into a bush. He took an unplayable and it led to a triple-bogey 7. But standing on the 10th tee, as Woods lurked on the tee box behind him, Mickelson still wasn't out of it, not yet. He curved a big cut around the corner and made birdie, but it was erased with a bogey on 11. Down at Amen Corner, the low, hallowed ground where Mickelson has spent a career revving up classic rounds that have gone down in Masters history, deflated patrons began to learn of his triple bogey on the 9th, which was now displaying like a sore thumb over the giant scoreboard left of the 11th green. More problems came on 12, where Mickelson dumped his Callaway into Rae's Creek. (Ironically, Woods did the same — for the second straight day — hours later.) He made double bogey, then bogeyed 16 and 18 on his way in, his approach flying wildly to the left on the last. As for Woods, he bogeyed the 12th after his water ball, ripped off birdies on 13 and 15 but bogeyed 16. He was hampered by poor iron play all day. He hit 10 greens, and when he did miss it was usually a big one. "I hit my irons awful today," he said. "I didn't control my distance, my shape, spins. I left myself in bad spots." Two days ago, the biggest storyline of Masters week was the amount of storylines of Masters week. Woods's reassurance headlined that list, and a refreshed Mickelson aiming to become the oldest to win a green jacket wasn't far behind. Mickelson never finished outside the top 24 in his six starts prior to the Masters. That stretch included a win at the WGC-Mexico Championship in early March, his first victory since 2013, and three other top 10s. "As you get older you feel a little bit more pressure with each (tournament) because you don't feel as though you have unlimited number of events," Mickelson said. "So given how well I was playing heading into this, I certainly put a lot of pressure on myself to perform this week and get it." Woods's major starts (as a healthy player in good form) aren't unlimited either. He knows that better than anyone. "Six months ago I didn't know if I'd be playing golf," he said. "Forget playing at the Tour level, I didn't know if I would ever be playing again. But it's incredible to have the opportunity again, to still come out here and play this golf course. Now I know I'm on the weekend. Even though I'm a lot behind, if I play a special weekend, shoot two rounds in the mid 60s, you never know." Years from now, Woods and Mickelson will meet on the first tee on Masters Thursdays, the ceremonial starters of the next generation. Until then, their next round is Saturday. It's an early tee time, and there's plenty of work to be done.